Recently I visited two Aquaponics farms. The farms were called, “Ouroboros Farms” and “SchoolGrown”. 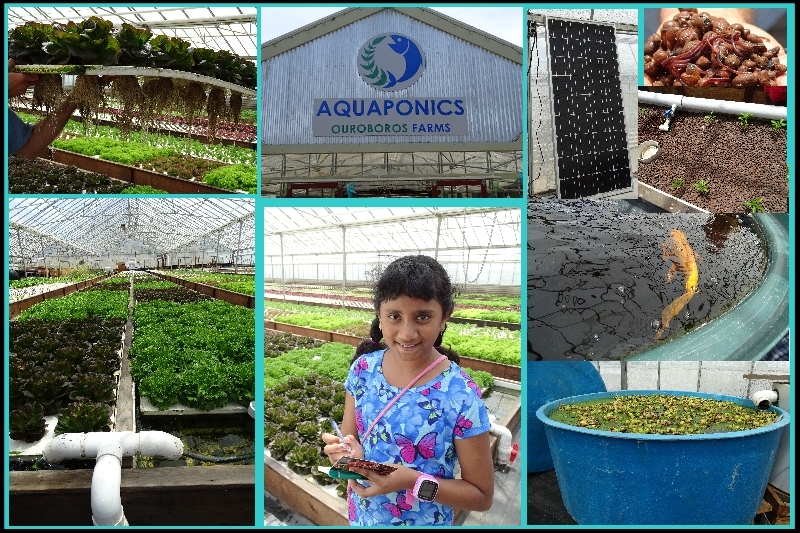 The tour of these aquaponics farms was thrilling because I like plants and animals. Aquaponics is an alternate farming method which combines Aquaculture and Hydroponics together. Alternate farming methods are going to play a very important role in our future. We can also grow plants without soil. Now here are some fascinating details I learned. Last year people ate more fish than beef. That is very important to note. We really need more supplies of vegetables and we also need more fish. But with the changing climate and droughts, it is a huge challenge. Aquaponics is the answer to this challenge. Aquaponics also conserves water. An aquaponics fish farm uses 99% less water, no cleaning is needed, and there is no need to change the water. Vegetables are grown with 90% to 95% less water, as the water is re-circulating. With this method we can grow more vegetables in less spaces and without soil. About 10 to 12 heads of lettuce can be grown per sq. ft., whereas in the old soil farming, only about 3 heads of lettuce per sq. ft. can survive because the roots need more space. The roots of one lettuce plant in the soil spread over large areas and can get as big as a Volkswagen beetle car! The plants grown in aquaponics farms grows fewer roots just enough to absorb the nutrients from the water, and they put all their energy in the rest of the plant growth, so plants are actually healthier. The aquaponics farm grows 900 carrots in just 2 sq. ft. In fish farms the nitrate level goes as high as 1300-1400 ppm, which is toxic. Dr. Rakocy made the filtration system that removes toxic and keep the nutrients. The duckweed plants, algae, worms, and other small good living creatures, creates an ecosystem that can feed the fishes as well as create minerals for plants. Not only vegetables, other types of crops like rice can also be grown in aquaponics method. The Ouroboros farm is organic. The pesticide used is Neem based. Mosquito fish are grown to eat insects. They strive hard to keep everything organic to maintain a good balanced ecosystem. The aquaponics farm with the solar technology is the non-profit organization, “SchoolGrown”. Their new solar powered water circulating system uses just 20W of energy to move 500 gal. of water. The roof solar is used for filtration and other energy needs. Amita Gowda, 8 years old is an active volunteer of Green Kids Now, and is already a youth speaker and has delivered several presentations in science and environmental topics.